I have never been a fan of audiobooks, but admittedly, I have only tried a handful. I was apprehensive about requesting to review this title yet I am a very big fan of the author, who has done so much to create positivity in the world, so I took a deep breath and tried something new. Wow. Why was I concerned? I am used to hearing Ms. Winfrey’s practical utterances and have improved my life due to several of the individuals who she has spotlighted, most notably Eckhart Tolle, whose philosophy has definitely made my life much smoother. I forget what a melodious speaking voice this exceptional woman has, and how she can make even the most esoteric of topics intriguing. I admit that she gets pretty philosophical with some of her musings but for the most part, listening to these CDs was like listening to a close friend sharing her trials and tribulations, her frustrations and her triumphs. I was delighted to hear about the cases of synergy that allowed her to do things like celebrate her birthday with close friends who were able to give her one of her most memorable concert experiences, and I could not stop laughing as I listened to the strain that a cross-country trip with her best friend, Gayle, threatened to wreak on their relationship. Ms. Winfrey shares the self-knowledge that she has garnered and allows us to see the influence that many individuals, both famous and not-so-famous, have had on her journey to self-knowledge and self-acceptance. The combination of wry humor, honesty, and insight into the human experience will enrich the listener’s life and prompt one to meet the challenge offered Ms. Winfrey by the late Gene Siskel...to determine what you know for sure. 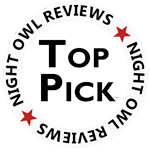 Personally, I know for sure, that this is my 1000th review for Night Owl Reviews and I have had a blast reading and reviewing all of these wonderful books! “What I Know for Sure” by Oprah Winfrey is a four CD set of selections from the column that Ms. Winfrey has published in her eponymous magazine. She muses on a multitude of subjects and events in her life and provides insight into how she has achieved the hard-won state of tranquility and grace that she lives in. There are fascinating glimpses of some of those who have shaped her life and philosophical statements about her, and our, journeys through life.